When we think of our childhood birthday parties, we think of cake, and songs, pin the tail on the donkey and pinatas. When your child is on the Autism spectrum, birthdays, like everything else, are complicated. There have been years when I have not wanted to celebrate Mae’s birthday, not because I don’t love to celebrate her, I adore her. But it made me sad when I spent time decorating the kitchen with balloons and banners so that like the other children on the mornings of their birthdays she can wake up to a party. Except, she doesn’t seem to notice, she comes into the kitchen, past the pink balloons and the streamers, pops up into her chair and awaits breakfast as if it were any other day. Her presents do not entice her; there is no anticipation about what she will like, or excitement that builds throughout the day. The truth is she doesn’t register her birthday or the fuss around it at all. One year I almost decided not to do anything, I was wiped out. I didn’t feel like decorating and fussing about her birthday when it didn’t seem to matter. When I mentioned this to a friend, she reminded me that birthdays aren’t about milestones or accomplishments. They are celebrations of a life. She was right, and I have never forgotten that advice. 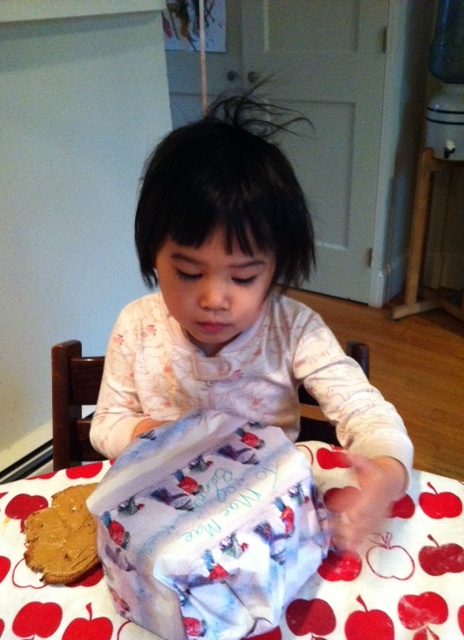 Mae’s birthdays are not necessarily about her being 5 or 6 or 7. They are definitely not about pony rides or pottery painting. They are about making a choice every year not to give up. When I decorate the kitchen for the other kids I do it because I know they will come down in the morning and be thrilled to see their balloons and banners. When I decorate it for Mae I do it for me. I do it because if I don’t it will mean that I have given up. The same way I ask her how her day was when she gets in the car at the end of the day even though I know she won’t answer, I will decorate the kitchen and buy her a birthday dress. I will send treats into school. I will spend time picking out a present for her, because it matters to me that I tried. We can’t just fight for our kids at school, or with doctors. We can’t just fight the isolation and strangeness of Autism by finding communities that accepts us and our children. My biggest fight is never to decide that because she doesn’t care I shouldn’t either. I care that it’s her birthday because I love her. I will continue to ask questions that go unanswered, and throw little parties that go unappreciated because if I don’t then it means I have conceded, and I refuse to give up on birthdays or my girl. Previous postHow do I know if I am good at this?